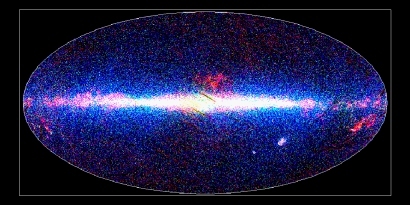 This AKARI view of the sky shows infrared sources at 9 micrometres in blue, at 18 micrometres in green, and at 90 micrometres in red. The image is arranged with the Galactic Centre in the middle, and the plane of the Galaxy running horizontally across the map. 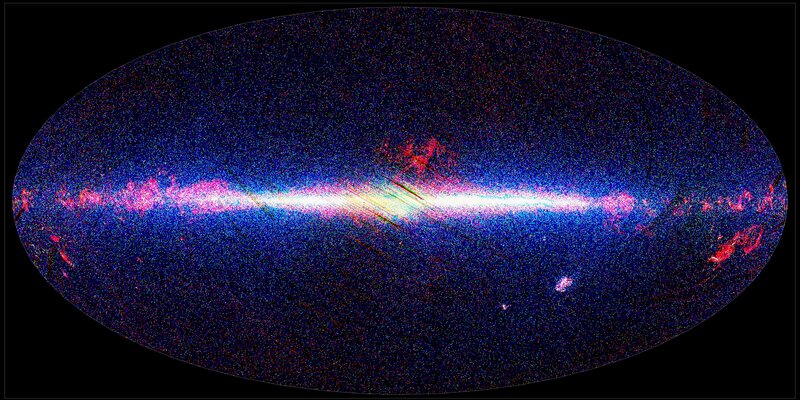 Emission from the photospheres of stars dominates the 9 micrometres catalogue, where the galactic disc and nuclear bulge are clearly visible, whereas dust and star formation in the disc of our Galaxy become are more prominent at 90 micrometres. Away from the Galactic Plane, many extragalactic objects are detected, tracing galaxy evolution and star formation in the distant Universe.